Spring Peeper Farm: Our little church in the vale. Our little church in the vale. Blogging is not always about happy things. This time blogging is about a sad thing. Some of you know that we belong to the Wesleyan church. Havelock Wesleyan Church to be precise. Tuesday at around 6:15 our local fire department got a call for mutual aid to the Havelock Fire Dept. Dave is in our local fire dept. When he heard on the pager that the Havelock church was on fire. Five fire departments fought valiantly till the wee hours of the morning to save the parsonage. Needless to say, nothing could be done for the church. 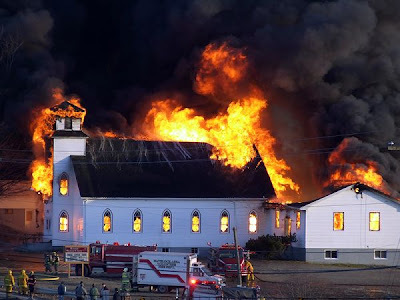 Our little church in the vale is gone. Nothing is left. A friend took this video. This was when he arrived on scene. Within 14 minutes it was mostly gone. It was our second home. So many memories are in there, not to mention all the records of every marriage, baby dedication, deaths etc....for the last 100 years. The church structure is gone, but our "Church" is still here. We will prevail. Sunday we had a service in the parking lot. It was bitterly cold, but nobody minded. We said our goodbyes to our church. I hadn't seen it in person, only in photos. When we crested the hill I just bawled like a baby. What is it about becoming a Christian? I never used to cry at anything before becoming a Christian. Now I cry at everything. Oh well, I'd rather be a Christian cry-baby than a tough athiest. Dave, J. and I got to church late so we had to sit in the balcony. Half way through the service Dave asked me if I smelled something. I did smell something funny. Nothing like a grass fire (like everyone was doing these last few weeks). It smelled like smoldering plastic. We asked other people if they could smell something, but nobody else smelled anything. Maybe it was a look at something ahead. I'm so sorry to hear about your church Lisa. Do you think it will be rebuilt? I suppose there were no copies of all the chruch records? Take care. Hello, I am wondering who took the picture at the top of your blog of the church (labelled 1907-2007). I would like to have a copy of it (i.e. save it on my computer) but I don't want to infringe on any copy write laws. 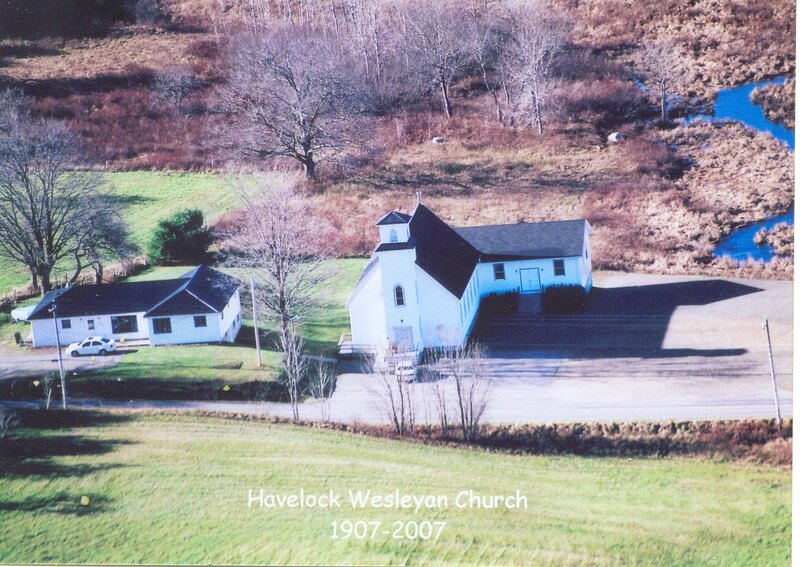 My mother grew up in Havelock, which is why I'm interested in the picture. Such a sad story about the fire. I've seen that the new building is now up and running though. What I do for my goats! !